1(pic)1(ca)1(bcl)1(cbn)/2220/3perc/prpf.hp/str(min 10.8.6.6.4); world instruments: rec*.medieval hp*.rebec*.sitar.tabla*.2 Tibetan hn*.Tibetan bowls and bells(chorus).pipa.sheng; (* Musicians may double on world and western instruments). For information on Chinese instruments and performers, please contact Parnassus Productions, Inc.
Marco Polo, an opera within an opera, marks a further stage in the composer Tan Dun's own spiritual journey, an exploration of a new language of music and performing arts through the fusion of Western avant-garde style with Eastern accent. Multi-cultural elements such as Peking Opera, Kabuki, Indonesian shadow theatre, and the face painting of Tibetan ritual are used. It has a duration under two hours, and plays without intermission. In Marco Polo, the spiritual journey (the cycle of the spirit and of Nature), coexists with a physical journey from West to East. The former is explored in the Book of Timespace sections of the opera through the participation of Shadows, Memory, and Nature in a Peking-opera style. Interwoven are the legendary adventures of Marco Polo as he makes his journey from Italy to China. 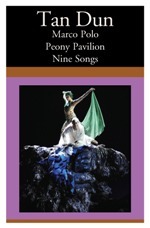 These sections are written in a more Western operatic style combining avant-garde and theatrical traditions and are played out by Beings, although with underlying echoes of the simultaneous spiritual journey provided by historical figures Dante, Shakespeare, and Li Po. Along with the geographical journey from West to East there is an important musical journey. Above the orchestra and chorus, there is a spicy ensemble of medieval European, Indian, Tibetan, and Chinese instruments which illustrate the changing scenes of the geographic journey. The fantasy-dream world of the spiritual journey and the exciting stories of Marco Polo's voyage are two operas that merge with the same goal, the discovery of experience from past to present to future -- from the known to the unknown. Marco and Polo, led by the shadows of Dante and Scheherazade, journey from Venetian darkness across seas, deserts, and the high Himalayas to arrive at The Wall, where Kublai Khan awaits them. Medieval chant, ancient timbres, violence, longing, and the sensuality of nature open a world of light. In four dreams and three interviews, Marco and Polo are led by the Shadows of Shakespeare, Freud and John Cage to examine inner space. Chuang Zi dreams as a butterfly; Mahler and Li Po drink to the song of the earth. In China or elsewhere, is contact possible? Can love be achieved? Kublai still waits; Marco and Polo give way to Marco Polo; the unending begins. Tan Dun's Marco Polo was, for me, a multi-dimensional experience which went beyond my expectations and indeed overwhelmed my senses, if not cooked my brains. Here was an opera for our generation: a fusion of elements across time and space, a true testimony to the way our worlds have become intertwined in the globalisation process. The avant-garde [Marco Polo] is actually an opera within an opera, and is more concerned about the process of journey than with Marco Polo's arrival in China..... Mr. Tan's music utilizes Eastern and Western instruments, and unexpected trills, howls and laughter to create an opera that is truly a synthesis of East and West.... In the best sense of the Wagnerian tradition of music drama, Marco Polo is theater and music working in concert. The contrast between East and West, mental and physical, light and shadow result in what can only be called classical fusion. Unlike many composers before him, Mr. Tan is able to include Eastern influences to create music that doesn't come off merely as an exotic quasi-Asian spectacle held at arms length by Western techniques.... The key to the success of Marco Polo is Mr. Tan's score. Tan Dun's Marco Polo is more spectacle than theater: grand ritual rather than grand opera.... Yet by the end of the uninterrupted 105-minute work, one is dazzled by the audacity of its production... The stage has an Old Testament emptiness, so its characters, slow, stodgy, austere in spite of their colorful costumes, come out like grandiose priests. This is the secret of this impenetrable work. For Tan Dun has created what no other living composer can even approach: a truly world music.... This is Tan Dun's brilliantly personal conception, and the results must obviously aspire his most astounding mind. Tan Dun puts both John Cage and Gustav Mahler in his pocket -- and turns them into Tan Dun. Someone has to come from China to do such a crazy thing! One's ear was constantly intrigued and charmed. Tan's music is so rich, so varied in influences and at the same time so personal that one immediately wants to hear more...[Marco Polo] was an overwhelming sonic experience, yet another proof of Tan Dun's master talent. Space and Time. Yesterday and Tomorrow. Today, Here. When Tan Dun connects musical forms of the world, the energy of an atomic fusion is created. [This is] incredibly rich and sensuous music...[which] hits the audience with the power of an Asian tornado. Tan Dun's score is daring and full of imagination...a unique sonic universe. Tan Dun's Marco Polo is poetry -- an autobiographical testimony sublimated into music of great universal power. A striking event. [Marco Polo] is an exotic, fairly abstract two-hour fantasy on departings and returnings ... in vividly picturesque costumes and slow-motion choreography. What counts is the continually fascinating soundscape... The Munich audiences were enchanted. The first season's most successful work: Marco Polo.... [Its] composer, Tan Dun, who was raised in China, mingled the vocabulary of his country's music with a Western idiom.... For Tan Dun, it was both an affirmation of identity and an appropriate element in a work that deals with the confrontation between East and West. The incorporation of Chinese instruments and even a Peking-style tenor simply placed a greater range of tone colors at the composer's disposal. Marco Polo, adapted by Paul Griffiths from his own novel, is about a journey; its main theme is not departure or arrival but duration, the comforting and alienating experience of travel.... Marco Polo comes close to the original 16th-century (or classical) ideal of a work that gives equal priority to art, dance, music, and poetry. There is no "story" in Marco Polo; there are events, as the two characters Marco (the Traveler) and Polo (the Memory of the Journey) (re)experience their journey to and through the Far East. Visually the smooth, slightly slick production incorporated the mannered quality of Asian theater.... None of this would have had any effect if the music hadn't been compelling. Aiding the variety of episodes in Tan Dun's score -- from a thin thread of Chinese percussion to a lush, European-style orchestration -- was a cast able to do interesting things and create weird effects with their voices while still singing well. Tan Dun's opera Marco Polo: first rate singers, an excellent production team.... A decisive success.... This sounds a bit eclectic and that is what it is. But that is the world of Tan Dun and he authenticates it musically. He opened with the light, piercing sounds of Peking Opera, demanding alongside the original instruments far-Eastern sounds from the strings...; then he moved to a more modern Western, strongly rhythmic tonal language and combined, as the journey proceeded, Gregorian chant, Tibetan harmonics, Italian operatic style, even a quotation from Mahler -- elements together straightforwardly, seriously and always recognizably, and with technical mastery. With Tan, the foreign influences never appeared to have been stolen or greedily exploited. His score shows exactly what the message of the piece is: patient, unagressive contemplation of the other person.... In Munich it was the talk of the town, not only among hardliners for new music. Tan Dun's Marco Polo [is] a dream journey into the Self...[a] musical calligraphy...His music offers a strikingly personal style full of naivete, artistic expertise, unrestrained imagination and captivating innate musicality. The musical journey gripped the imagination...The sound-world [Tan Dun] created was unique, and dull would be the soul declining the invitation to enter it. [An] overwhelmingly colorful, artistically breathtaking piece...this was amazing!